Six rental car companies, Advantage, Avis, Budget, Enterprise, Hertz and National are located on airport. Four others provide off-airport car rentals. Registration counters are located in the Baggage Claim area. On airport rental car offices are located on the ground level of the Terminal 2 Parking Garage. 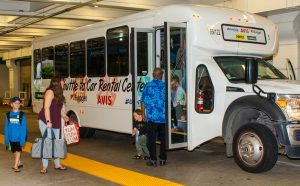 Car rental shuttles stop in designated areas along the center median on the ground level outside of baggage claim areas.